Good and easily understandable weapons for STK has always been hard to come up with. 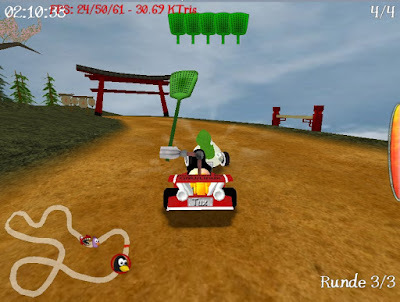 Some of them have been revised over the years, and we've gotten a few new and original ones as well, mainly the plunger and the item swap weapon which are quite unique to SuperTuxKart if I am not mistaken. With the change from 0.6 to 0.7, a lot of the core of the game was rewritten, and thus there were fewer major gameplay changes. Now that's mostly out of the way, including major bugs (right? ), so more focus can be shifted towards refining the game and adding more elements to it. Recently, we've gotten two new weapons to play with in the game. The first one I've touched upon in an earlier blogpost, but now that funto has more or less finalized it, it's time for a screenshot. We're also getting a rubber ball weapon from hiker, which will eventually replace the anchor weapon. 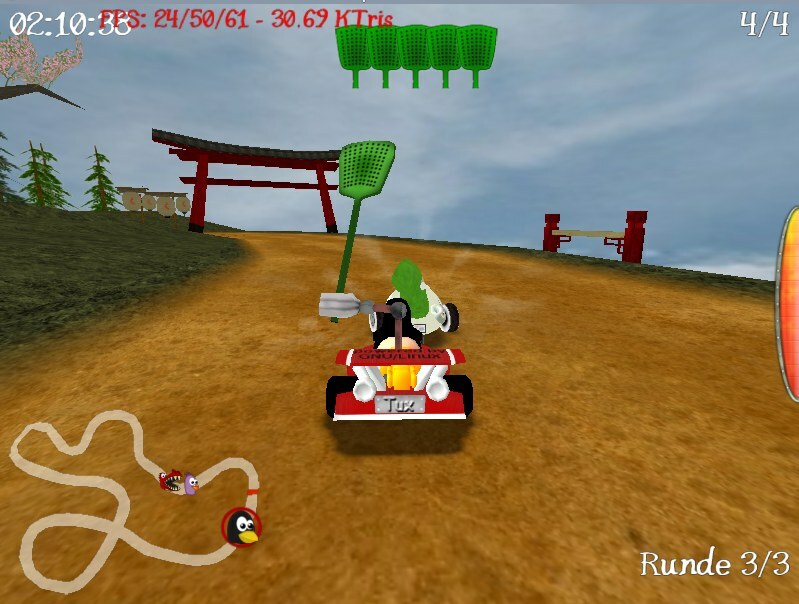 The rubber ball bounces along the track, aiming for the leading kart, with the added nasty of squashing karts along the way, which will slow them down temporarily. Hopefully it should be easier to understand than an anchor popping up from nowhere, as the rubber ball will bounce more rapidly as it's reaching its goal. We could use some nice sound effects, both for this weapon and the swatter, so contributions are welcome. ;) The appearance of the ball might still change, so I'm not posting a screenshot of it this time. Speaking of sound effects, qubodup has started a "STK Sound Liberation" project, which aims to replace dubiously licensed sound effects with DFSG-compatible samples. Also, there are other sound effects that could be improved, though as far as software freedom goes, the dubious ones should ideally be replaced quickest. But SFX quality should be mostly up to par or better than the current effects, since we don't want to sacrifice quality unless it's really necessary. Anyone wishing to join this good effort can head over to these forum threads: STK Sound Effect (SFX) Liberation and Unhappy with Sound Effects? Flames and motion blur when using a zipper. Doesn't that sound awesome? Well, we've got it now! Apologies for the frame refresh spoiling the screenshot a bit, but you get the general idea. 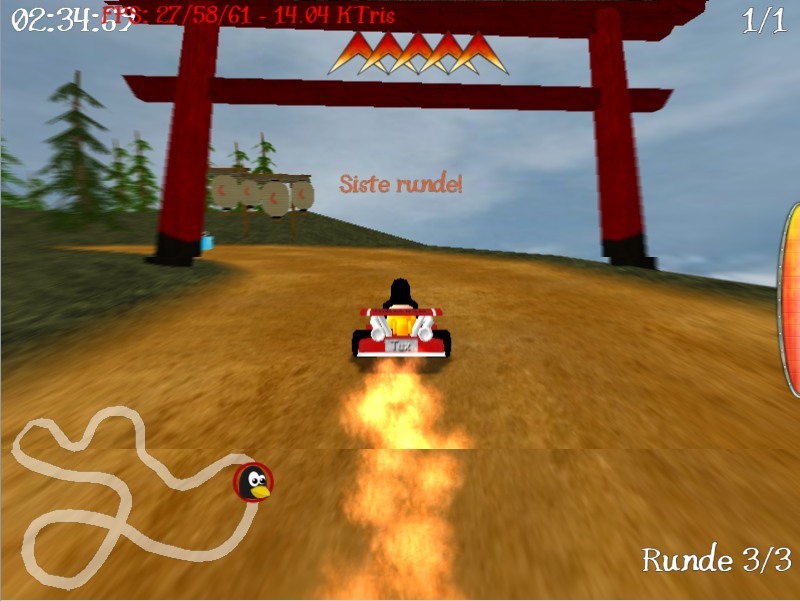 The motion blur is the work of funto, and the flame effect is by Auria. Combined the effect is really nice, and adds an extra sense of speed while you're zipping merrily along the track. Isn't that...? Oh yes, it is. A new nice, juicy track by samuncle. Isn't it beautiful? It will most likely replace Secret Garden for the upcoming 0.7.3 release. The old garden will be put in addons, readily available to expand the track selection if you so wish. I think that there are too many characters, it is necessary to delete(eliminate) some, it is necessary to improve cards(maps) rather than to create it of news(short stories). ok, all right, but what is that the site will be translated into French because I am not very good in English? There are how many developers? I'm one of the previous anonymous people you had... A suggestion I would make is this: you provide the basic set which is pretty much saying "these are the best, most loved, and/or whatever", and yet have those track be able to be removed via the addon menu, much like installed addons can be now. For instance: I never play with Hexley, or Wilbur, or a few others. I just don't. At the same time, I have a lot of the addons installed: so much so that I have three rows of loading icons before it's done. It would just make it that slight bit quicker. Adding the ability to remove the default content within the game would be cumbersome as we would somehow have to interface with elevated rights in Linux distros, and furthermore it may break challenges for people. Also, karts and tracks aren't hardcoded in the game, so you can manually remove the folder(s) of those you don't want to play. Je peux essayer de chercher des contributeurs pour améliorer le site officiel qui est moche visuellement et qui n'est pas traduit. 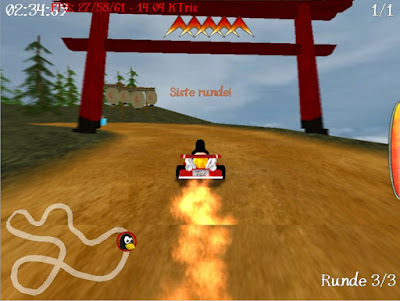 When will Supertuxkart 0.7.3 come out. Thank you Auria. Good Luck for you. How can I update the svn version. I have the Subversion downloaded and installed but I dont know how I can update STK. Can somebody help me please? Anonymous: this would be a better question for the forum. If you are asking how to update your SVN, the command is "svn up". If you are asking how to build STK, this will depend on your OS. I think that all this improvements are great. But since the very first version the most important thing (which transform this good game in a masterpiece) would be a network game. I mean: it is wonderful to play alone, but friends are the reason for which many people play. After so long wait I've buyed a Wii and Supermariocart, so I can play very fun matches. When will stk0.7.3 come out? 0.7.3 is due in a couple weeks hopefully. Great, soon 7.3 in a little more than a week. STK 7.3... What do you mean? i dont like hexley. it just seems it is the one who throws bombs at me a lot. PLZ DELETE IT!!!!!!!!!!!!!!!!!!!!!!!!!! Due now or later? NEED JAPANESE VERsION or i do not know there s one. thks. 0.7.3 ROCKS!!!!!!!!!!!! DUE WHEN?? GOING CRAZY HERE> AWNSER PLZ!!!!!!!!!!!!!!!!!!!!!!!!! do you have a deinite date when it will come out? Karts all have the same characteristics for now - so if Hexley is bothering you it won't help removing it. We will release a release candidate soon, probably in the middle of next week. Final release date should follow shortly after. Regarding a Japanese version: you can change language within the game. But we rely on volunteers to translate the game, so if there is no Japanese version, maybe you can help out with that? 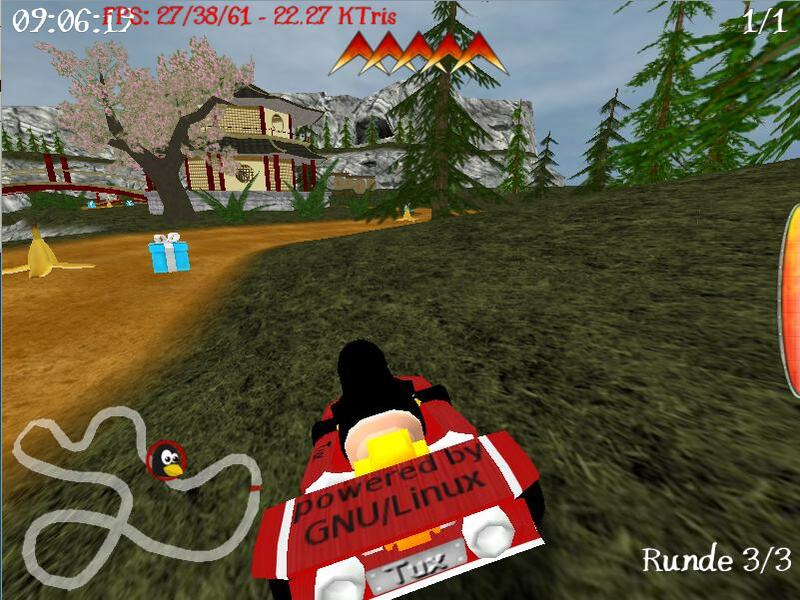 SuperTuxKart doesn't follow any release schedule, so a release happens when the devs think it's ready, and when they have time to do it.